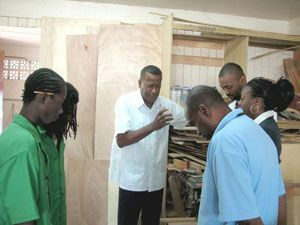 The step came in the form of five new pieces of machinery that were blessed at the companyâs workshop in Lodge Village on Tuesday, November 13th. Surrounded by close friends, family members and their two-man staff, Managing Director Rayan James recounted the early beginnings of the company. James credited his wife Angelica for being the driving force and motivation behind the company, which was founded in 2005. He stated that the company would not have been where it is today, had it not been for her steadfastness through the tough early stages. He indicated that the machines, which include a sander and a number of saws, would not only improve the quality of work, but also cut down on production time and the wait by customers for the finished products. He thanked the two-man work team of Raoul Weekes and Anascasius Lewis who have both been with the company for nearly two years, for their dedication and loyalty. Following a number of hymns and prayers of thanksgiving, the deeply religious couple had the machines blessed by their marrying Pastor Gevandean Wilson. Before blessing the equipment, Wilson reminded management and staff to keep God in the midst of the business, and he will take them to fulfilling their goal. James said that the next step to achieving their goal is the employment of new workers, with more plans in the pipelines.